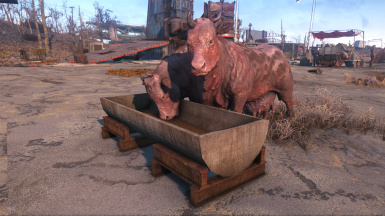 Tired of feeding your Brahmin from a bathtub? Me too, so I made some new meshes/textures from scratch. Standalone meshes for both feeder and trader outpost. 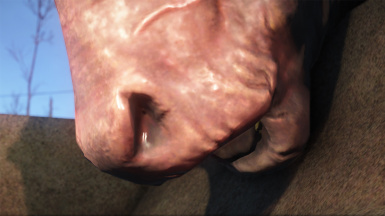 Filled with delicious (ew) Brahmin feed. Longfellow's Cabin Little Village Optional, still there's nuka world brahmin feeders. But you'll loose caravan post. National Park Visitor's Center Little Village Optional, just for 2 brahmin feeders and one caravan post. Oberland Station Little Village Optional, you'll miss only one Caravan's post. Sanctuary Little Village Optional, just for one. There's 3 vanilla too inside the barn. Starlight Drive In Little Village Second caravan's postation, realistic brahmin feeders. 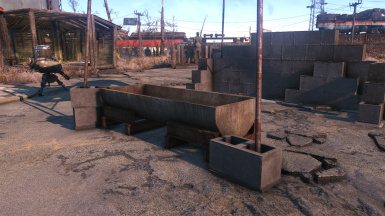 Tenpines Bluff Little Village Optional, used only for one brahmin feeder. The other 2 are from Vanilla. Please do not re-use assets from this mod, or upload anywhere else without my express permission. Hotfiles? Really? Slow week! haha thanks you guys. Tiny little quick mod. I know troughs are kinda popular at the moment but seeing those was motivation to finally finish a model I started a while back. I got tired of feeding Brahmin a) invisible air and b) from a broken bathtub. I mean, the player can craft a turret from scratch, and build entire multi-level buildings, afterall, why not give your source of food/milk (MILK THAT BRAHMIN!) a proper eating area? AND SOME FOOD? 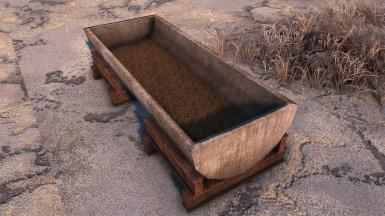 This adds 2 new meshes and textures, all made 100% from scratch, to the Workshop. One for the feeder, one for the trader caravan post. 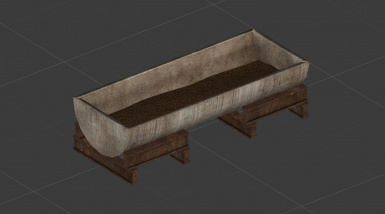 They're cement with some welded rusty iron blocks underneath for support (I modeled these based on a photo of a DIY cow trough I found.) They are filled with Brahmin feed pellets as well. They are standalone and will appear next to their vanilla counterparts in the Workshop menu. Because it's standalone it's also compatible with any of the other trough mods that fill up the vanilla troughs, etc.